Southborough residents are invited to St. Mark’s gleeful celebration of music. It’s the 27th anniversary of the school’s annual a capella festival. 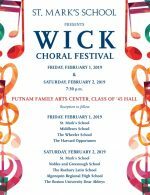 The Wick Choral Festival was established in 1992 in memory of Myron A. Wick, SM Class of 1933 in honor of his lifelong enjoyment of singing, through the generosity of the Wick family and friends. In addition to their students, the free concerts include groups from area high schools (including Algonquin), and each night features a college ensemble. This year, the festival is Friday, February 1st and Saturday, January 27th at 7:30 pm both nights. It takes place in the Class of 1945 Hall, Putnam Family Arts Center. 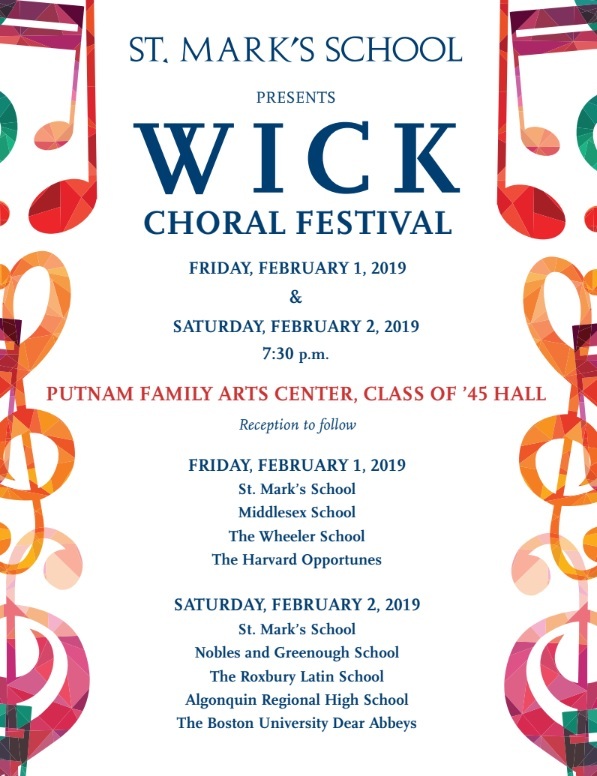 St. Mark’s School is happy to invite the public to attend the annual Myron A. Wick Choral Festival on February 1 & 2. Each night, St. Mark’s welcomes three or four other high schools and one college headliner group for a celebration of a cappella singing. On Friday, February 1 at 7:30 pm, the program will include St. Mark’s own Marksmen and Royal Blues groups, as well as the MXolydians, Bateman’s Bullfrogs and Small Chorus from the Middlesex School, Concord. They will also welcome the 18 Wheelers from Wheeler School in Providence, R.I. The college headliner will be the Opportunes, a mixed group from Harvard University. 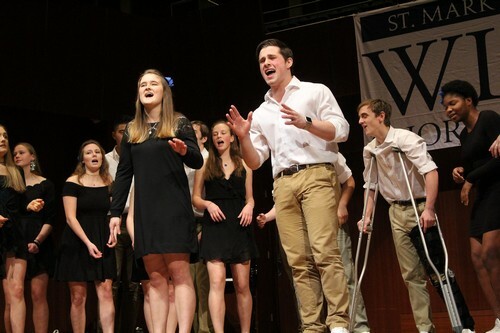 In addition to St. Mark’s a cappella groups, the Saturday, February 2, 7:30 p.m. concert will include the Greensleeves and Nobleonians from Noble and Greenough School, Dedham, Ladies First and Algoncapella from Algonquin Regional High School, Marlborough, and the Latonics of Roxbury Latin School. The college headliner group on Saturday will be the Dear Abbeys, an all male group from Boston University. The concerts take place in the Putnam Family Arts Center, Class of ’45 Hall. Look for the blue “Arts and Athletics” sign on Rt. 85 for parking. Admission to the concerts is free and there is no reserved seating. There will be a reception after each concert. Come and enjoy the remarkable singing of these talented and dedicated young people!